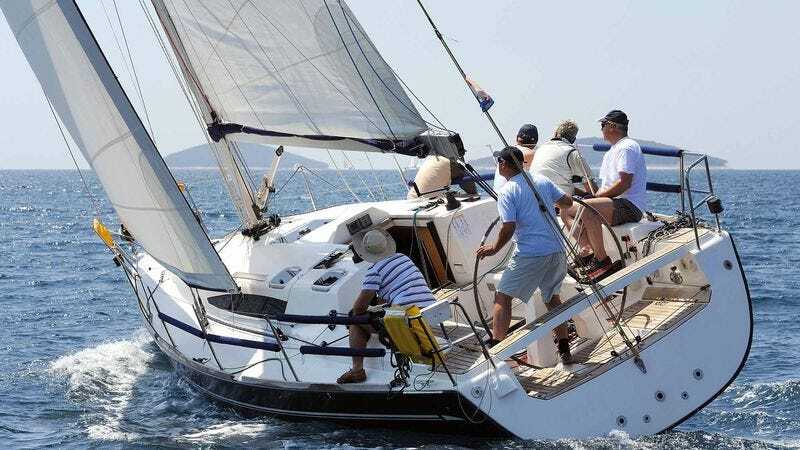 PALO ALTO, CA—Explaining how economic conditions were drastically altering citizens’ behavior and spending patterns, a report released Wednesday by researchers at Stanford Business School revealed that rising income inequality was causing more wealthy Americans to take on a second sailboat. “While those with higher incomes used to be able to get by with just a single reliable sailboat, that is no longer the case. Over the past 15 years, changing financial circumstances have led more and more affluent individuals across the country to get a second watercraft,” said the report’s lead researcher, Robert Anthony, adding that nowadays it’s not uncommon for a rich American to have to juggle two, or sometimes even three 40-foot luxury sailing vessels, which are oftentimes located far apart from one another at different marinas. “For many of the individuals at the top of the socioeconomic ladder, it is no longer even a matter of choice; to give their families the lives that they want for them, a second double-masted sailing ship is the only option that makes sense. In fact, if you visit some of the nation’s wealthiest neighborhoods, you rarely even see the primary earner in any given household, as they’re almost always out on one of their two sailboats at any hour of the day.” The report noted that the growing nationwide disparity in wealth was also forcing many of America’s richest citizens to make the extremely difficult decision between an infinity pool or a saltwater pool when buying an additional property in California’s wine country.